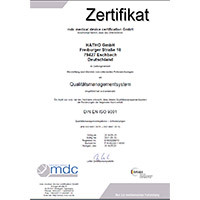 Our quality management system is now certified conformable to ISO 9001:2015. Save time, increase brightness: The new HATHO RapidPol Set improves the surface of acrylics master models (rapid prototyping) quicker than ever before. 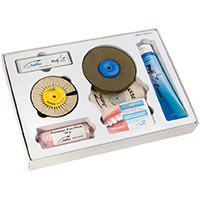 HATHO’s new AcryPol Compact Set reduces the polishing of acrylic dentures into three easy steps. The extraordinary polishing results are convincing! 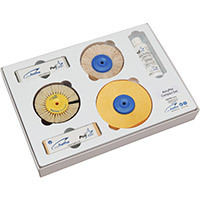 3 Steps Thermoplastic Polishing Kit. Fast and easy pre-polishing with Scoth-Brite Multi Layer brush and Polistar Lintygrey. Effective shine polishing with COSIMA Soft buff and cream. Perfect high shine polishing with Polistar Pro Pink. HATHO's new practical protective cap and particle catcher is made of very light plastic and is ideal for collecting and collecting dust and precious metals. Perfect for neat and clean work. 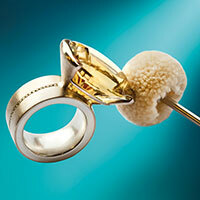 At the Inhorgenta, once again HATHO presented its high-quality miniature brushes and polishing discs. Soft goat hair, medium-hard horse hair, hard chungking bristles, fine-walled steel or brass wire as well as fine cotton twine are the selected filling materials for the perfect range of HATHO miniature brushes and buffers. 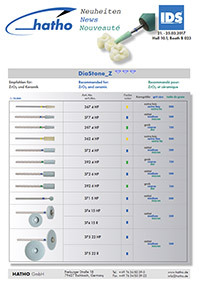 They are the ideal polishing tool for fine filigree polishing.